Dehydrating is great for food storage, and dehydrated food can be pretty delicious too. Dehydrating is just the method of removing moisture from food. This changes the food’s texture and taste, but more importantly slows growth of microorganisms and drastically increases the storage life. While you can dehydrate almost any food, certain foods have qualities that make them better suited for long term storage. Higher acid content and lower fat content can help a dehydrated food have less potential for spoiling. Dehydrating food can cause the food to lose some nutrients, but up to 90% of them can be retained if you dehydrate food at a lower heat for a longer period. 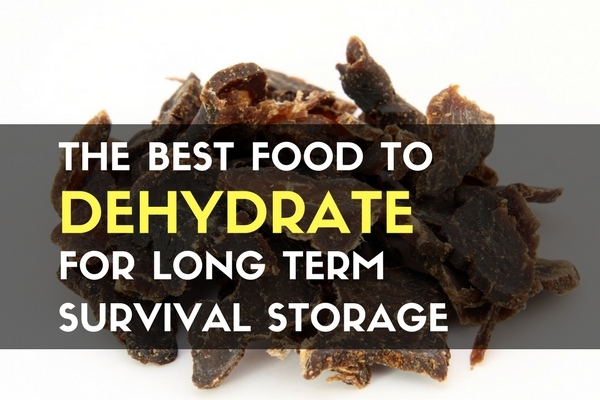 Some common dehydrated snacks you are probably familiar with include beef jerky, banana chips, and trail mix fruit. If you don’t have one already, you will need a good dehydrator. Some foods can be oven dried or air dried, but having a dehydrator will allow you to dehydrate any food on the list below. Dehydrators come in a wide range of sizes and prices, but the best one to get started is probably just the Nesco FD-75A Snackmaster Pro. Being on the cheaper side will let you try dehydrating without investing too much money, but it still has the capacity and capability to be used to improve your long term food storage. Whether you are dehydrating fruits, veggies, or meats you will want to use fresh supplies that are not blemished and that dry well. Dehydrating pairs especially well with gardening, since you can harvest your garden and dehydrate everything you can’t use right away while it is ripe. The same is true for hunting large game, since you will need to freeze or preserve large amounts of meat anyways. You can even take advantage of farmers market or supermarket specials and stock up on supplies when they are on sale. Fruit is great for dehydrating for long term storage or just for a snack on the go. Pick perfectly ripe fruit, wash them thoroughly, and then slice into thin slices. The thinner the slice, the quicker the drying. Some smaller fruits can be dried whole, but require a little bit more time. Apples and pears may turn a brownish color when dried, but they are still safe to eat. If the discoloration really bothers you, you can treat the sliced fruit before you dry it with ascorbic acid for a few minutes to preserve the color. Vegetables make a great choice for dehydrating but can take a little longer than fruit because they usually have less acid. Just like the fruit, you will want to wash thoroughly and then slice. Some vegetables need to be blanched, which means boiling them and then dropping them into icy water. This slows the enzyme breakdown to a crawl which will help preserve flavor and texture. You can typically dry vegetables for a longer time, reducing their moisture content all the way down to 10%. Dehydrating meat is a great way to preserve it to last a long time and provide much needed protein during a disaster. Lean meat is always best, since fat does not dehydrate well and can cause jerky to spoil quickly. Some meats will require some sort of treatment to kill microorganisms before drying, especially if you are using wild game meat. Freezing the meat can make it easier to slice into thinner portions, which can make it easier to dry out. You want to cut slices no larger than ¼” and even that would be pushing the limits. Cut the meat against the grain with a sharp knife for a less chewy but a more tender texture. The best choice for dehydrating meat is using lean beef. 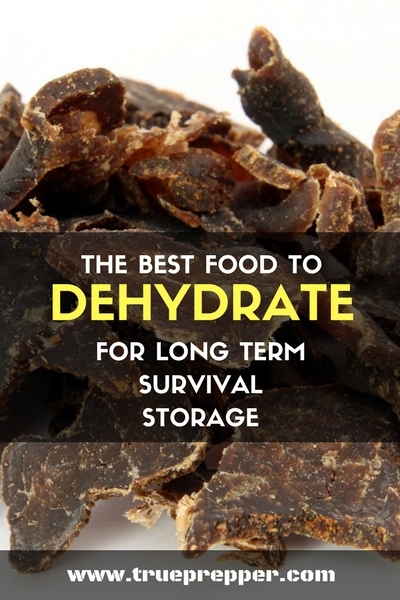 Using a dehydrator is a great way to boost your long term survival food storage. We recommend using a healthy mix of food items, storage methods, and an inventory system to maximize your survival potential. Make sure you use a good airtight storage container to further increase the storage time of your dehydrated foods. Keep exploring, stay prepared, and be safe.